You wanted an ironing board so luxe, your little black dress could eat caviar off of it. 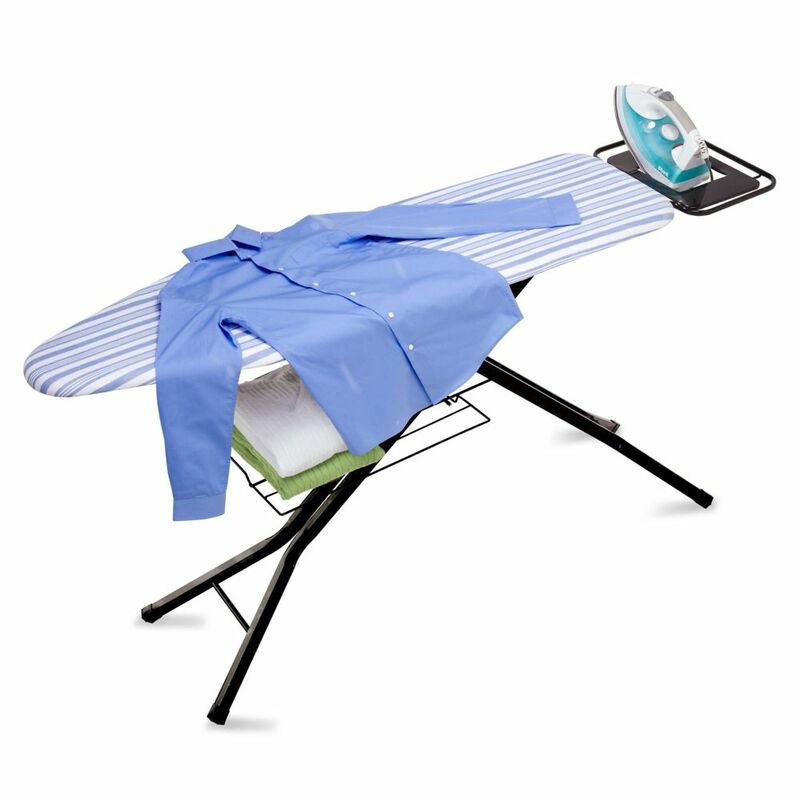 That's when you discovered this Adjustable Deluxe Ironing Board with Iron Rest. With one look you thought, "You should be bronzed" and in fact, its steel frame is. You can also shift its height up to 36-inch tall, in case you feel like pressing your most luxurious duds in a pair of high heels. And while this stand-up ironing board will help you steam your garments into privileged perfection, it also works on every day work shirts and more ordinary pairs of pants. This truly versatile, energy saving clothes dryer allows the rising warm air to pass through, drying the clothes in your unutilized ceiling space. Each individual rod is raised and lowered by a nylon cord, for easy hanging separately as needed. The neat, compact design allows it to be installed in many different areas. This stainless steel fold-away laundry rack gives you ample room to dry your clothes the natural way with 42ft of drying space. Complete with convenient adjustable arm settings, a place to dry shoes or slippers and the versatility to use indoors or outdoors, its a fantastic energy-saving drying solution. Honey-Can-Do HMP-01403 Dual Compartment Laundry Hamper, Brown/Taupe. A decorative laundry solution for bedrooms and baths, this hamper looks as good as it is functional. Clearly marked "Lights" and "Darks" compartments make sorting laundry a breeze. Full-sized compartments can hold in extra-large loads of laundry with the mesh drawstring top. Sturdy metal frame is removable for storing the hamper flat when not in use. Laminated interior is easy to clean and keeps mildew from forming on the exterior fabric. Keep clothes off of the floor and your space neat and clean with this great-looking hamper. This multipurpose Foldable Ironing Laundry Centre and Valet from Honey-Can-Do features a built-in ironing board (43-inch L x 14-inch W), dual laundry sorter, iron rest and hanging bar. The thick foam pad and heat-resistant, cotton/canvas cover provide a smooth ironing surface every time. An integrated, steel wire iron rest is the perfect spot to rest a warm iron and prevent scorching. The sorter boasts two removable laundry bags for simple sorting and convenient carrying and washing, incorporating mesh sides for ventilation and an interior coating to resist mildew and odours. The attached hanging bar is great for keeping already ironed garments crisp and wrinkle-free. Rolling casters with locking wheels allow you to move the laundry centre from washing machine to ironing space quickly and easily, and the entire unit folds down in seconds for easy storage when not in use. Adjustable Deluxe Ironing Board with Iron Rest You wanted an ironing board so luxe, your little black dress could eat caviar off of it. That's when you discovered this Adjustable Deluxe Ironing Board with Iron Rest. With one look you thought, "You should be bronzed" and in fact, its steel frame is. You can also shift its height up to 36-inch tall, in case you feel like pressing your most luxurious duds in a pair of high heels. And while this stand-up ironing board will help you steam your garments into privileged perfection, it also works on every day work shirts and more ordinary pairs of pants. Adjustable Deluxe Ironing Board with Iron Rest is rated 4.2 out of 5 by 15. Rated 4 out of 5 by Anonymous from Exceptional value! This item offers exceptional value, sturdiness and it is significantly cheaper on HomeDepot.com than purchasing from the manufacturer. I'd change the color of the legs and iron rest to silver finish, but there's nothing else I'd want different about this item. Rated 4 out of 5 by char from It's solid and the features all work easily. Only thing, it's a little too heavy and big. It's solid and the features all work easily. Only thing, it's a little too heavy and big. Rated 4 out of 5 by nick from Need to put soft rubber feet on the legs so it does not slide. the hard plastic feet do not grip ... Need to put soft rubber feet on the legs so it does not slide. the hard plastic feet do not grip well on bare floors. the legs have a tendency to slide outward making it less stable. I put rubber casters under the feet which helps with this issue on bare floor use. Rated 4 out of 5 by Annie from I haven't had to purchase an ironing board in a very long time. This one is very sturdy. Just a... I haven't had to purchase an ironing board in a very long time. This one is very sturdy. Just a slight bit of confusion on how it works as there were no directions ( who would have thought I would need directions.....) to set it up. I like the iron holder. Allows me more room to press fabric and I like the shelf underneath to stack my ironing that is either completed or has to be done. Rated 4 out of 5 by Dan from Really like this ironing board. I like all the height adjustments and the stability. But, I was... Really like this ironing board. I like all the height adjustments and the stability. But, I was disappointed that the table was plastic and I found out the hard way that the convient holder allows the iron to stay really hot. I was ironing a light shirt on the normal setting I always use and melted right through it. I have learned not to put the iron in the holder and all is OK now.